I can honestly say that I never thought this day would come, but Samsung has gone ahead and pushed out an update to Bixby on the Galaxy Note 8 (likely Galaxy S8 and S8+ too) that lets you disable the Bixby button from opening Bixby Home. It’s not April 1! It’s not my birthday either! What is happening!?! Bixby can (almost) be disabled! In order to get the most important Bixby update in Bixby’s short history, you’ll simply need to open Bixby first. Sure, for old time’s sake, let’s press that Bixby button one last time to open Bixby Home. You should see a prompt to update Bixby (tap the “Update” option in the pop-up), which will then lead you through a bunch of Bixby-related files updating. Once done, you’ll want to scroll all of the way up to the top of Bixby until you see the three icons to the right of “Hello Bixby.” They should look like the icons in the GIF above, with a globe icon, settings gear, and 3-dot menu. Tap that settings gear, watch as a new setting appears that allows you to stop the Bixby button from opening Bixby Home. 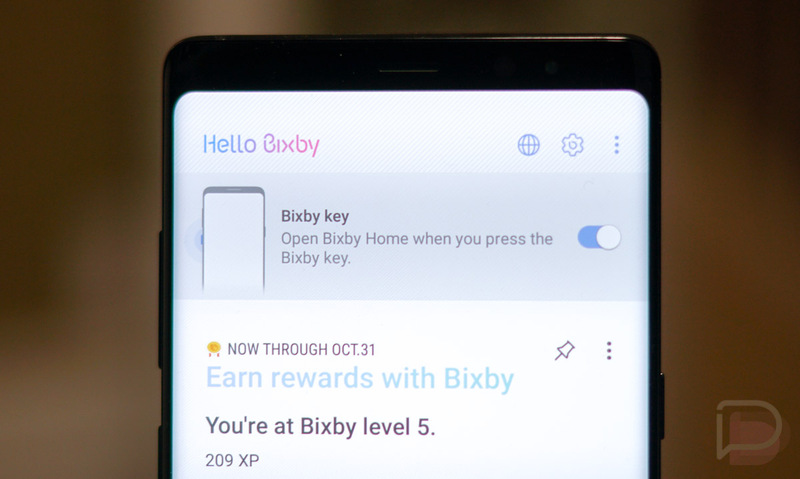 If the steps above aren’t working, you can also press and hold the Bixby button to activate Bixby Voice and say, “Bixby Settings.” That should open Bixby settings where you’ll want to scroll down and look for the “Bixby key” option. Tap that and then choose the “Don’t open anything” dot to again, disable Bixby Home from opening when the Bixby button is pressed. I’m currently running Bixby Home version 2.0.03.3 and Bixby Voice version 1.0.10.8. If disabling the Bixby button from launching Bixby Home isn’t enough, don’t forget that you can also fully shutdown the panel, assuming you are using the stock Samsung launcher. Simply pinch on your home screen (or long-press on it), slide over to the Bixby Home panel, and toggle it off. Boom, no more Bixby experience. I should point out that this isn’t a full Bixby disable. Instead, you are disabling Bixby Home from opening when the Bixby button is accidentally pressed (because who presses Bixby on purpose?). You will still be able to use Bixby through voice or by pressing and holding the Bixby button to activate that same Bixby Voice portion. In fact, you still can’t fully turn off Bixby, but this at least kills off the assistant from opening when you don’t necessarily want it to. Pressing and holding to open Bixby is a purposeful action, whereas the simple touch of a button that could interrupt everything you were doing wasn’t. This option should have been there from day 1. Thanks, though, Samsung.